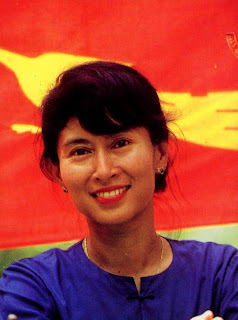 Aung San Suu Kyi, Happy Birthday! Looking as young as 36, Suu Kyi spent her 63rd birthday on June 19, in the confines of her house - nothing new for the Nobel Laureate spending her 13th year in isolation from the entire world. Here are the most sincere wishes sent her way - A long and healthy life, continued hope and support, and most of all, a fervent prayer for the junta to shed their bullheaded behaviour. The lady is amazing. Good you put her on you blog. There few people who can devote their lives to causes they value. She can be counted among the living legends. Came to your blog from Indrani's. Joining you in your wishes and prayers for Suu Kyi. Indrani... :). Thanks for reminding! Responsible Advertising - An oxymoron? Solar Cookers - Let's welcome them home!